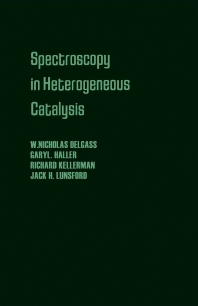 Spectroscopy in Heterogeneous Catalysis deals with the applications of spectroscopy in heterogeneous catalysis. The concepts and capabilities of a particular technique, experimental procedures, and examples of all proven or potentially important applications are discussed. The use of spectroscopic measurements in guiding empirical approaches to applied problems and to fundamental studies of the chemical identity of catalytic surfaces is also described. This book is comprised of eight chapters and begins with a discussion on the scope of spectroscopy in catalysis and applications of spectroscopy to zeolite catalysts. The following chapters focus on infrared spectroscopy, with emphasis on the theory and interpretation of infrared spectra; Raman spectroscopy and the theory of the Raman effect; diffuse reflectance and photoacoustic spectroscopies; and Mössbauer spectroscopy. Electron spin resonance spectroscopy and nuclear magnetic resonance spectroscopy are also considered. The final chapter is devoted to X-ray photoelectron spectroscopy (XPS) and its application to core electrons, along with the experimental equipment and procedures used. The applications of XPS to studies of surface behavior and catalyst composition and chemistry are outlined. This monograph will be a useful resource for physicists, researchers, and potential researchers in heterogeneous catalysis.